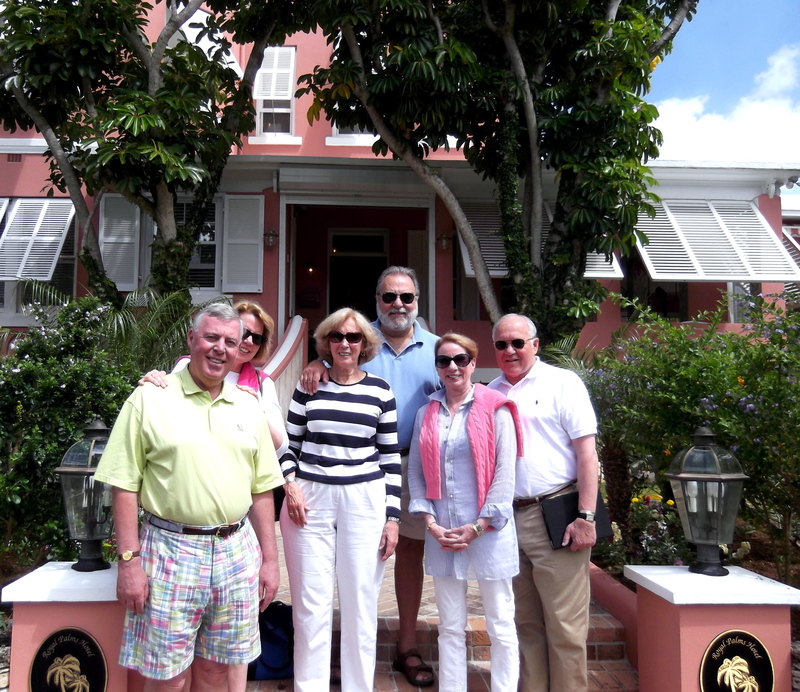 Day Two greeted us with sunshine, a light breeze and cheerful birdsong at the complimentary Royal Palms breakfast. However, our high expectations for the day, which included a round of golf at The Mid-Ocean Club for Colin, Bernadette and Bob, a ferry ride to St. George’s and getting swizzled at the Swizzle Inn for Betty, Cathie and me, as well as dinner for all at Tom Moore’s Tavern, were to be quickly dashed by the onset of what would turn out to be a 12 hour storm. Our first inkling of the need for flexibility was an e-mail, warning of impending thunderstorms and the recommendation that golf be postponed for two days. That ruled out the idea of a ferry ride to St. George as well. 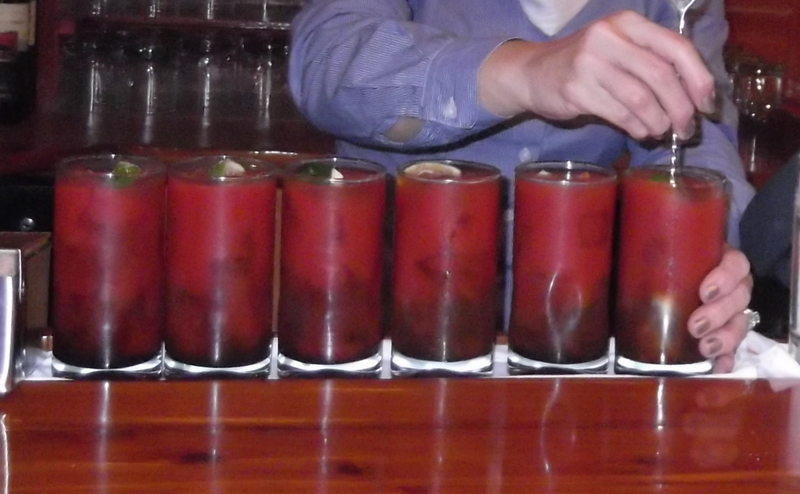 We held an emergency committee meeting in Ascots bar and over a round of Bloody Mary’s, it was decided that we would walk down to Front St., instead, do some shopping and then have lunch. Gifts for the grandchildren, linens for the table, and assorted dry goods having been acquired, Cathie, our Bermuda guru, after some quick research, suggested Bolero for lunch. Here is where serendipity stepped in and changed the rest of the trip. We arrived at Bolero Brasserie fairly well soaked, the rain having begun in earnest about 20 minutes earlier. As we were being seated, the wind out of the southwest increased in intensity, sheets of rain pounded the windows and the view of the harbor across the street was completely obscured. But, we settled in at our table, ordered several bottles of well-chilled Sancerre, and studied the fantastic menu. The Starters included: Mouclade, (mussels steamed with leeks shallots, garlic, Vermouth, cream, a hint of curry), it sounded, looked and was delicious and The Literate Chef has placed this on his ‘to-do’ list; Posh Egg Benedict (poached egg, Parma ham, truffle Hollandaise, toasted baguette) was well received by those who ordered it; and the special that day, a small Cassoulet (which has been on The Literate Chef’s ‘to-do’ list ever since a trip to southwestern France and the Canal du Midi) that I could not resist. Suffice it to say, it was an interesting menu and deserves many more visits. The Mains were equally interesting, but the choice here was much more daunting. Choices! Choices!! Choices!!! I opted for the Pan-Roasted Bermuda Rockfish and was not disappointed. I decided to try to replicate this at home, but since Bermuda Rockfish is presumably only available in Bermuda, I used locally caught (off of Martha’s Vineyard according to our local fishmonger) Black Sea Bass. Since it is not as thick as Bermuda Rockfish or Striped Bass, which would have been my first choice, I decided to Pan-Sear rather than Pan-Roast it. The quantity of the other ingredients was pure guess work on my part. 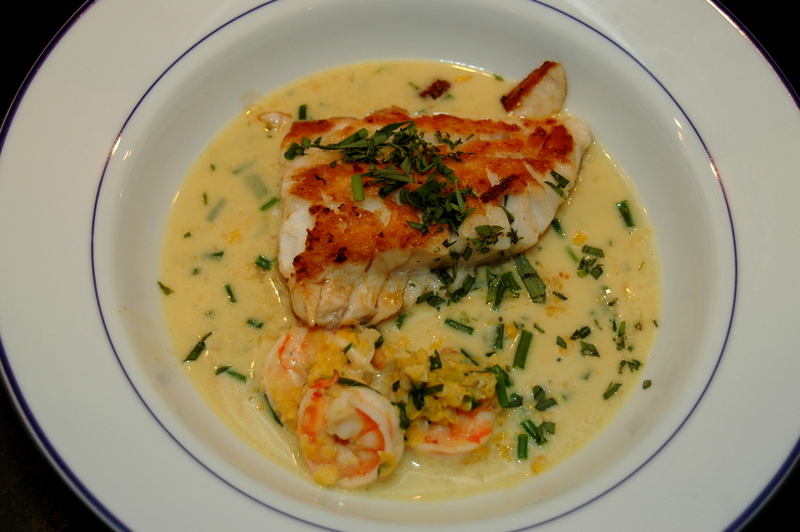 Even if you don’t like coconut flavor, I recommend that you try Pan-Seared Black Sea Bass, as the coconut milk is substantially diluted by clam juice and pureed roasted corn. We leisurely enjoyed our lunch, but the working people had to get back to work and the restaurant began to empty out. Being excluded from that category and as the torrents of rain were still pounding the window, we were in no hurry to leave. The table next to us seemed to be in a similar situation. One of guys there, noticing that our supply of Sancerre had mysteriously been depleted, came over generously bearing a bottle of wine and introduced himself. Dave is the Sales & Marketing Manager of Wairau River Wines of Marlborough, New Zealand (think eyebrow when pronouncing Wairau), and he came bearing a bottle of his delicious Sauvignon Blanc, which was as good, if not better than the more expensive Sancerre. As luck would have it, when we invited Dave to join us, he sat next to Bob, a veteran Rugby player at Fordham University and the New York Athletic Club, who is anything but shy. Bob, a very quick study, offered that he had been to NZ and played in a Rugby match there in another life. As it turned out Dave is also a Rugger and not only that, but upon further discussion they discovered that they knew several players in common, despite the fact that age wise, Bob could have been Dave’s father. Degrees of latitudinal and longitudinal separation rapidly diminished, and with a common interest in Rugby and wine having been established, the afternoon took a decidedly different turn. Laughter and stories abounded, Dave introduced us to his friend and associate, Matthew, VP of International Sales for Terlato Wines International, which markets Wairau River wines. Matthew joined us with a bottle of another wine that Terlato markets, a delicious and very seductive Two Hands Shiraz, to be exact. As the wines were consumed and the stories continued and we learned about grape growing and wine production in New Zealand, someone mentioned The Haka, a traditional dance form of the Maori. New Zealand teams frequently perform it both locally and internationally before a game. After much coaxing from the Americans, Dave agreed to give us a performance of The Haka. He was fantastic and it was the highlight of the day. Meeting those Kiwis, drinking wine and telling and listening to stories was an absolute delight, and to think, it might never have happened if that storm had missed the island and we had gone on with our original plans. But there was to be an additional bonus from that dark & stormy afternoon, Dave and Matthew told us about Beau Rivage and Chef Jean-Claude, and serendipity would abide. With travel, as with most things in life, planning is important, but be prepared to change your plans as circumstances warrant. Flexibility is essential and serendipity can be its reward. The idea for a trip to Bermuda was conceived 15 months ago in a pub in lower Manhattan, when six friends were discussing their past travels and favorite vacation sites. Someone mentioned Bermuda and Bernadette stated that she had never been there. Colin, Cathie, Bob, Betty and I had each been there on more than one occasion, with Cathie having been there innumerable times. Bernadette is probably the most organized person I know. In a moment of pure genius she suggested that if we were serious about this, each couple should kick in $200 per month to build a kitty to cover, lodging, meals, drinks, taxis, etc., and that she would volunteer as treasurer and open a bank account to hold the money. This seemed like a painless way to plan for a trip and also would signify our commitment to the idea. The Bermuda veterans all agreed that the month of May would be the best time for a visit, and if we started contributing right then, we would have between $8,400 and $9,000 for our land costs. It was also agreed that each couple would handle their own flight arrangements. Time inexorably moved forward, the checks were mailed, the kitty grew and in January of this year we begin to plan in detail…pick the dates, book the flights and focus in on where to stay and what to do. Cathie, the most-seasoned Bermuda traveler, volunteered to research where to stay and where to eat, while Betty volunteered to research the pubs. Day One arrived. Betty and my part of the trip started out from Boston’s Logan airport in the middle of a tremendous rain storm. 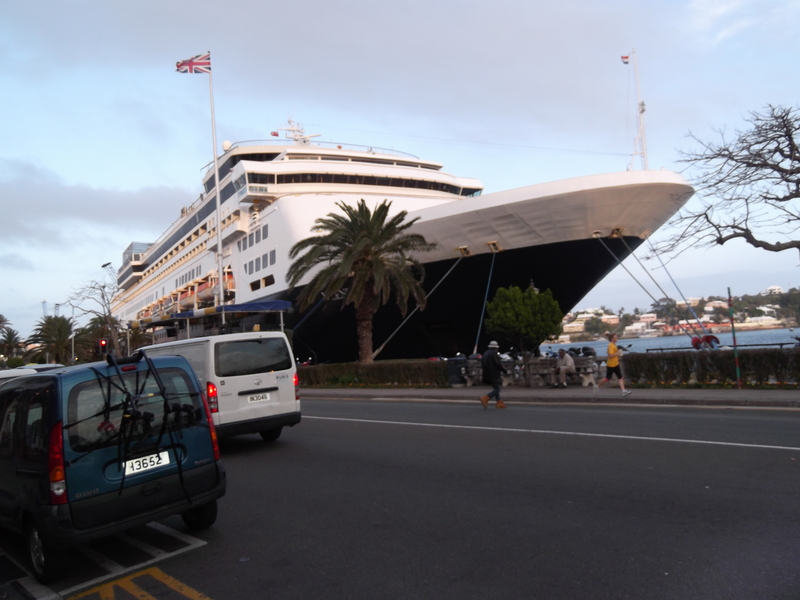 Weather reports for Bermuda ranged from sunny, to cloudy, to rain. Such is life! But when we arrived on the island, a mere two hours later, the sun was shining and reflecting off of the ubiquitous white roofs, the ocean was cerulean reflecting the sky and a light breeze was blowing billowing white clouds overhead. It was picture perfect! Bob and Cathie, having arrived from New York 30 minutes earlier, greeted us as if they were native Bermudians and the adventure began. Cathie’s hotel selection was outstanding; The Royal Palms exceeded our expectations. The website pictures had not lied, and the staff members were friendly, courteous and would prove to be most helpful, as weather-related circumstances would dictate a change in plans on more than one occasion. While awaiting the arrival of Bernadette and Colin, who were expected a few hours later, we decided on lunch at Ascots, a fine restaurant attached to the hotel. 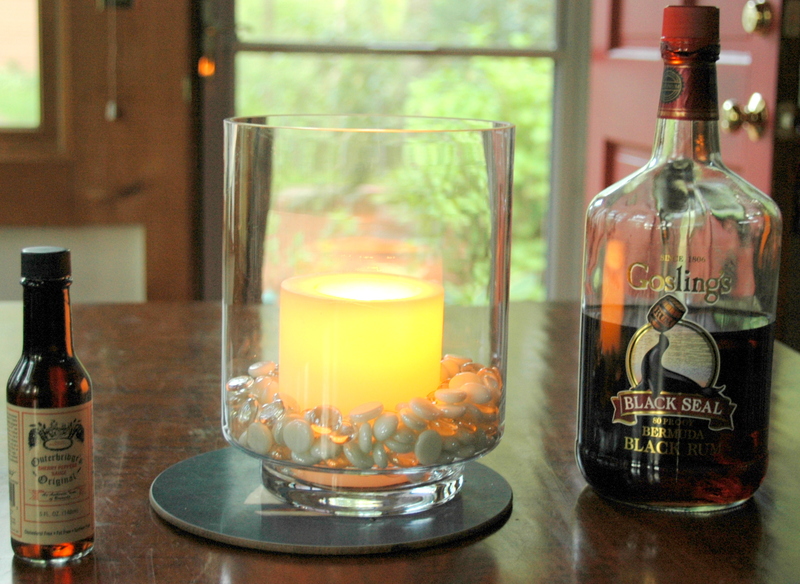 Dani, our charming hostess, brought us a round of Dark & Stormys to kick off the alcohol fueling for the day. 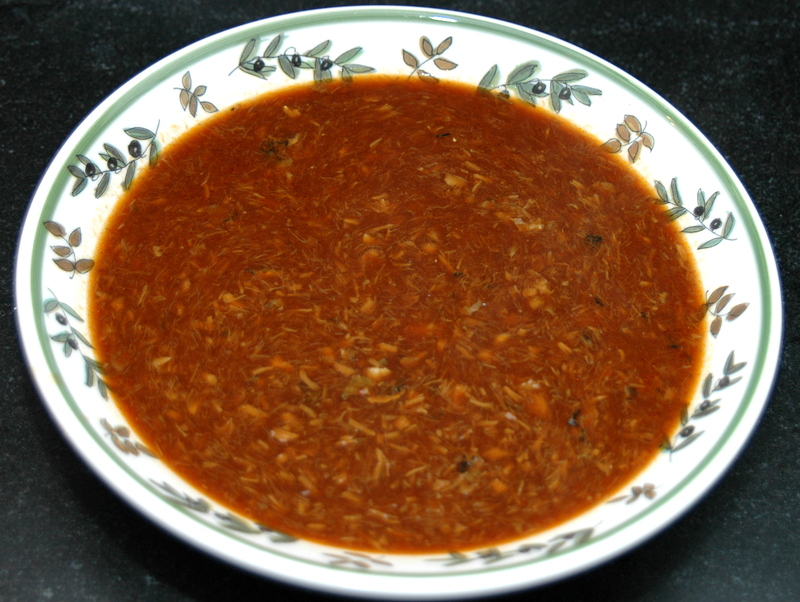 Being surrounded by hundreds of miles of the Atlantic, fish was a natural choice and the Bermuda Fish Chowder, laced with Gosling’s Bermuda Black Rum and Outerbridge’s Sherry Peppers Sauce did not disappoint. Neither did the Grilled Spicy Snapper sandwich, nor the rum raisin ice cream, nor the second round of Dark & Stormys. That evening, after Colin and Bernadette had arrived, it was time to begin spending our cache. Our esteemed treasurer was equipped with credit cards and cash, so off we went to our first pub, The Robin Hood. Next, looking forward to some fine English fare we set off for the Hog Penny. Once upon a time in New York City, English pubs and their fare were quite common, my first introduction to which was in the late 60’s at The Jolly Sixpence, which today, unfortunately, is but a happy memory. Liquid refreshments at the Hog Penny Pub consisted of several pints of Boddington’s (Watney’s, which used to be a standby there 40 years ago, was nowhere in sight). My victual of choice was Steak & Kidney Pie, a difficult decision, as my inner Brit also called out for the Bangers & Mash and the Fish & Chips. The Steak & Kidney Pie was delicious and the others, which were ordered by members of our group, also received rave reviews. The service was outstanding as well, and our waiter, Morgan, was most helpful in providing me with a quick & easy recipe for Yorkshire Pudding, as I was trying to copy it down from the menu. But that will have to wait for a winter Sunday afternoon, when cooking a Prime Rib. Nightcaps, accompanied by live music, were enjoyed at Flanagan’s before we headed back to the hotel and crashed for the night. 2 lbs. of pickled beets, coarsely chopped with about 24 oz. of their pickling marinade. 1. Combine the beets, cucumber,scallions, dill and black pepper in large bowl and mix well. 3. Add sour cream to thicken soup and keep stirring until the sour cream is fully mixed in. Serve soup cold. In Lithuania it is served with sides dishes of boiled potatoes topped with dill and/or hard boiled eggs. About four years ago I traveled to Lithuania on business. Being my first trip to Eastern Europe, I didn’t know what to expect. 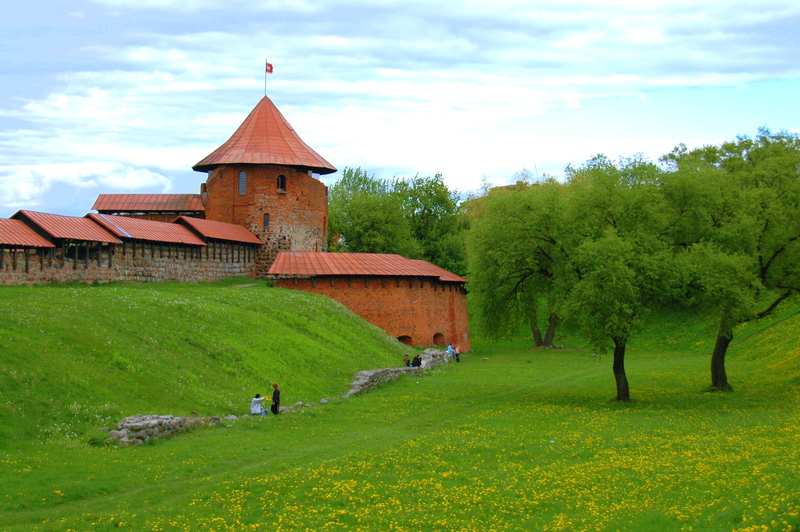 This former Soviet republic has a varied and rich history dating back to the middle ages. Situated as it was between Prussia and Russia; it has seen invasion, annexation and general turmoil over the centuries, with brief periods of independence and relative calm. With the collapse of the Soviet Union in 1991, Lithuania is once again an independent nation with a republican form of government. It is the largest of the three Baltic countries, the others being Latvia, its immediate neighbor to the north and Estonia, farther north. It is bordered on the east and south by Belarus, on the south by Poland and on the west by Kaliningrad (Russia) and the Baltic Sea. 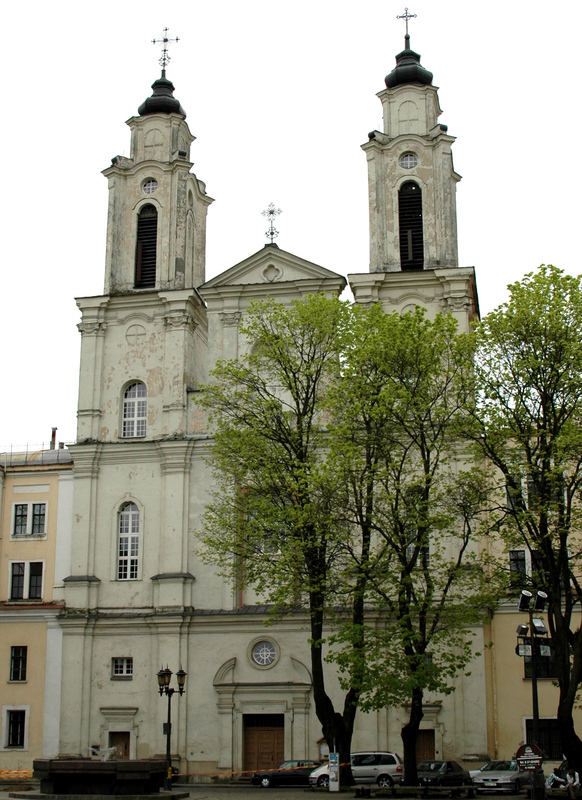 Vilnius (known as Vilna, when it was occupied by Poland), with a population of around 550,000 is the capital. 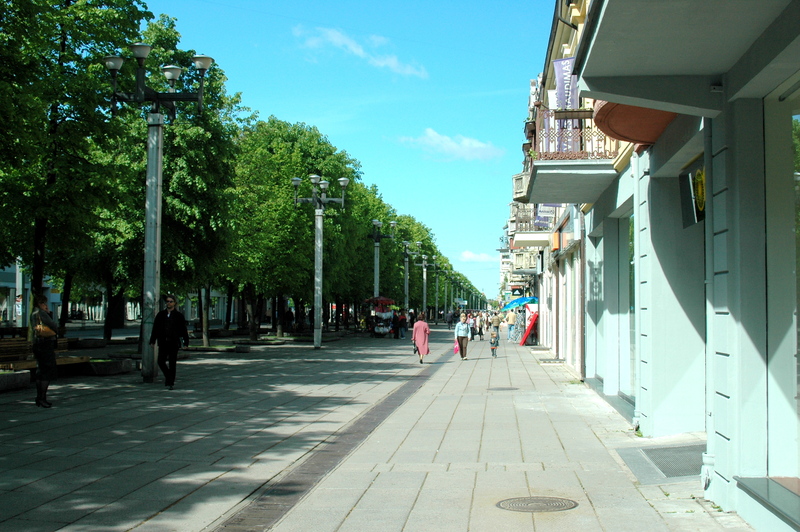 The next largest city is Kaunas, with a population of about 350,000. After changing planes in Helsinki, I flew into Vilnius where my friend Col picked me up. We drove through the city, farmland and forests for about 90 minutes to Kaunas where our office is located and where I spent the next week. The first thing that struck me about Kaunas was the architecture, which ranges from what I would call Medieval-Teutonic to Baroque to Late-Soviet Concrete, with a touch of Byzantine thrown in, in the form of St. Michael the Archangel Basilica. 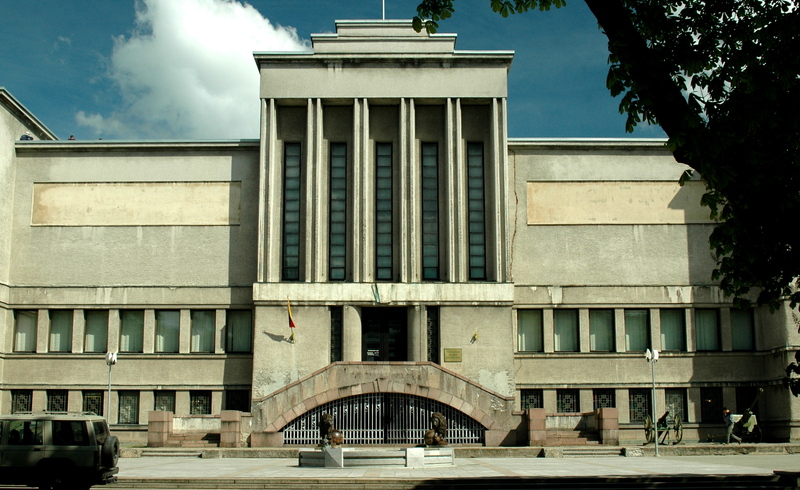 These diverse architectural styles reflect Kaunas’ long and varied history. A fascinating aspect of the city is its main avenue, Laisvès, which is a pedestrian mall that connects Old Town with New Town. 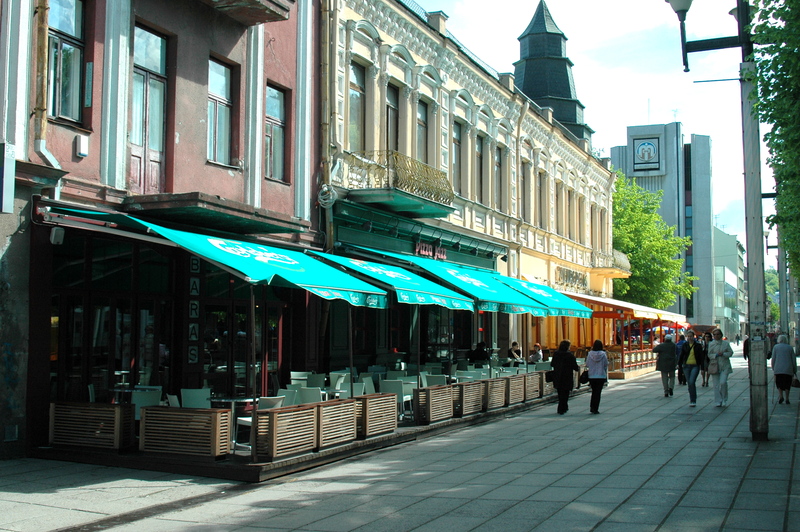 It is lined with shops and restaurants, many of which offer outdoor seating for the great sport of people watching. The food in Lithuania is both foreign and familiar, given its long historical relationship with Poland, Russia and Germany I recognized many of the dishes, with quite a few unique ones mixed in, such as Cepelinas, so-called because the resemble zeppelins, although these bombs are anything but lighter than air! Made with grated potatoes and meat, and served with sour cream, you won’t need to eat again for 24 hours. 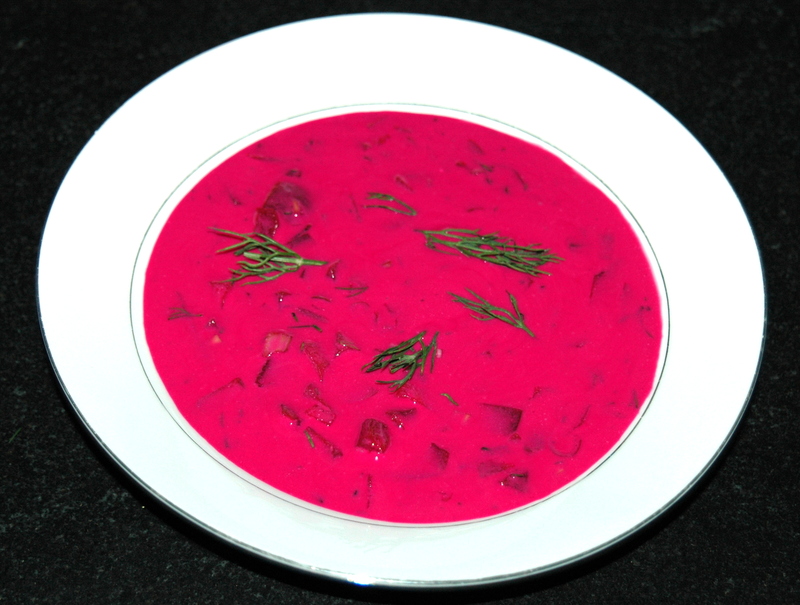 The Lithuanian dish that I enjoyed the most was a cold borscht soup known as Saltibarsciai (sal-ta-bar-shy). Arriving in Kaunas midday, Col, Patrick, Serge and I went to lunch at their favorite restaurant across the street from the office. We sat in the sunny courtyard and I ordered something off the menu which seemed familiar to me, but whatever it was, it was forgettable. However, the cognoscenti: Col & Pat, both Americans living in Kaunas for the past year, and Serge, a Lithuanian national, ordered the Saltibarsciai. I was struck by its beautiful purple hue, which in the bright sunlight of a Kaunas afternoon took on the color of a field of lavender. The next day, already feeling like a native, I too ordered the Saltibarsciai, and had it for lunch or as a first course for dinner, practically the entire week. Returning home I emailed Serge for his recipe and here it is, Saltibarsciai a la Serge. As one of our readers wrote, he loves beets, because they taste like dirt. Although that is not an analogy I would use, I am sure that this Saltibarsciai will appeal to his taste buds. I hope that you try it and enjoy it as much as I.
I don’t know about you, but prunes make me smile. As a child I hated them, particularly as prune juice, which my mother felt was a sure-fire remedy for whatever ailed me. While I still have no love for prunes in their juice form, I have come to appreciate their fruity, dark sweetness, either the dry, finger-sticky kind, or the plump, juicy kind. It is the latter kind that I decided to recently experiment with. But either type will work. If using the dried type, be sure to soak them in boiled water first and then drain them, reserving a bit of liquid for the sauce. I came across Pork Tenderloin in the local supermarket, and unlike most that you find, this one was not marinated. Pork tenderloin is usually sold vacuum packed with 2 one-pound tenderloins in the package. They are low in fat, about 10 inches long and narrow, maybe two inches wide. Because of their narrowness, they cook through in 10 to 15 minutes. The marinated type, which come in a myriad of flavors, are a great boon to mankind; merely rip open the package, throw them on the grill and 15 minutes later slice them up and dinner is ready. The un-marinated kind are a great boon as well. As I was moving through the supermarket aisle thinking of how I was going to prepare the tenderloins, I recalled how last year I experimented with Pork Chops with Apples, Raisins and Calvados and also Pork Chops with an Apricot Mango-Chutney and Cognac. Some sort of fruit seemed like a good idea, and, I still had a bottle of Calvados at home. When I saw a jar of prunes in liquid on the shelf, bingo, I had it! Slice the tenderloins, brown them in a fat, add the prunes and flame-off with the Calvados – Pork Medallions with Prunes and Calvados. The only hard work here, if you want to call it that, is pitting the prunes. Hint: If using the wet prunes pit them while the medallions are browning and with a small salad as a side, dinner is truly ready in 15 minutes! If using the dried ones, soak them in advance.